For me, eyelashes have always been such a big focal point when I look at myself or someone else. I can’t really complain that I have a lack of lashes or really even short lashes, but I still wanted longer, fuller lashes. I debated whether to get Eyelash extensions or to try out Latisse. My mom tried Latisse a few years ago and she absolutely loved it! Seeing her progress made any reservations that I had, disappear. So how did I decide what to use? I was SO ready to try eyelash extensions. I’ve had multiple friends and coworkers get them and they always catch my attention. They’re gorgeous and make for an easy makeup routine, since you don’t need mascara. The reason I decided against eyelash extensions was mainly because I wear contacts. With my contacts I’m constantly touching my eyes and lashes. I know the upkeep is generally a few weeks, but I didn’t think I’d be able to even last that long. Another reason I decided against them, was because I enjoy the look of eyeliner and mascara. Although the eyelashes provide an easy, makeup free look, I like the way at the mascara and eyeliner open up the look of my eyes. My reasons for Latisse were basically my reasons against eyelash extensions. 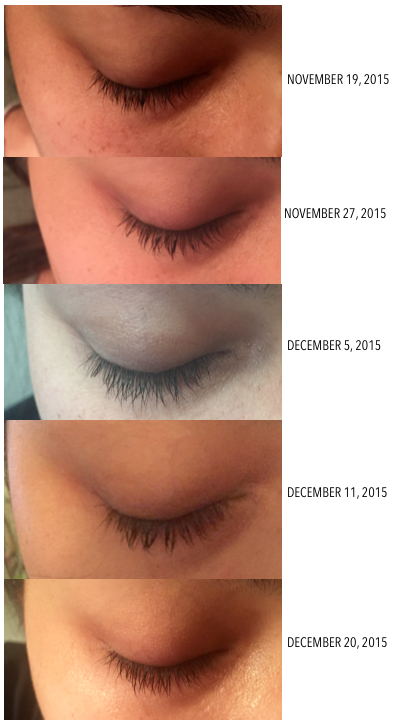 The Latisse is very easy to apply nightly, and although not an instant change, I was able to see change within a week! I like that I am still able to apply all the eye makeup that I want and I can remove my makeup as usual without trying to get around pulling out any extensions. Now, Latisse is not cheap and that was another aspect to consider when comparing Latisse to eyelash extensions. Most Latisse retailers require you to get a prescription, but Dermacure Valencia did not require it because my mom had used it before. We purchased two 5mL bottles of Latisse for $222.00 and we received a mail-in rebate to receive two 3mL bottles for FREE! I’ve been using my 5mL bottle of Latisse for about 3.5 months and have not run out yet. I use 1 drop of Latisse per evening for BOTH eyes. The directions recommend to use two different drops on different brushes per day, but if I’m using makeup on both eyes, I don’t see why I can’t use this on both. One drop is absolutely plenty and with the remainder I put it on any thinner parts of my eyebrows. I think the results speak for themselves! I’m very happy with the outcome and I still use Latisse most days of the week. I hope this can help you decide what is best for your lashes.